The Russell Hobbs RHM2031 is a stainless steel microwave, featuring a built in grill, 20 litres capacity and 800w of microwave power. The microwave also features a digital timer. Looks great - stylish and practical finish to the exterior. A slightly more subtle logo would have been nice - asides from that it's great. 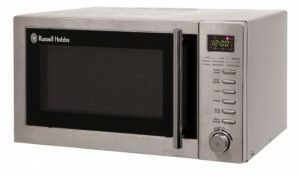 This stainless steel microwave is a mid range offering from the reliable Russell Hobbs, priced at just over the £60 mark. In terms of aesthetics, the RHM2031 microwave oven looks great - a brushed stainless steel finish looks stylish and has the added bonus of hiding fingerprints. All of our testers liked the modern appearance - it will suit most kitchen styles without clashing. The six buttons and one dial system makes it easy to control the kitchen appliance, and during our test period we found it cooked food evenly, with no cold spots or areas left uncooked. The grill works well, and left food evenly browned, thanks to it's 1000w of grilling power. At 800w it's not the most powerful microwave out there - however it works well and is very easy to use. It features a large and easy to open handle, and our testers found the interior easy to clean. Bear in mind that it only provides 20 litres of capacity - and so may be unsuitable for larger families / dishes - asides from that it's a great looking and performing silver microwave. 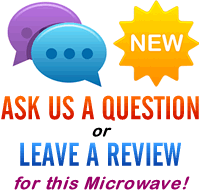 If you're looking for a reasonably priced microwave with a grill built in, then the Russell Hobbs RHM2031 microwave will meet your criteria. Stylish yet functional and reliable.